Corporate events- Argentine Tango in Delhi. Are you in charge in your Company for organizing events? Are you looking for innovative ways to impress your clients, employees and directors? It takes a team to Tango. Business is a dance between two companies. People are organization greatest assets, who have the power to "make or break" the organization and affect its productivity. If the people are aligned, the organization is very powerful. Are you done with jungle trekking and "leap of faith" trust games? Tango is a very social dance. It is a great way to melt the hierarchy, know each other one to one, develop trust, rapport and communication and bridge the gap between clients and employees or the team members. We can hold workshops for Corporates that are truly fun, productive and social. The workshops can be designed and modified as per your needs. In a corporate situation, employees may have little choice but to follow. But are the results the best they can be? On the tango dance floor, the leader invites someone to dance (follow), but the follower chooses whether or not to accept. Hence, the ultimate power lies with the follower. Good leaders attract many followers. The difference between a good leader and a great leader is the emotional input and therefore how the follower feels during, and as a result of, the interaction. Tango's journey involves taking a risk, venturing into the unknown, stepping firmly but not knowing what will come next. It is like learning "the wisdom of uncertainty"; a way of dealing with reality where you are ready to foresee what is coming based on a deep perception of the here and now rather than anticipating reality based on already fixed paradigms or patterns. The business world is evolving in ways that cannot be anticipated with orthodox paradigms. Argentine Tango can help provide insights into new ways of coping with changing paradigms. Explore the differences between positional negotiation and principled negotiation. Learn what it can mean to have a shared intention and move as a unit moving/working efficiently is a manifestation of elegance. Elegance can be attained in any setting. 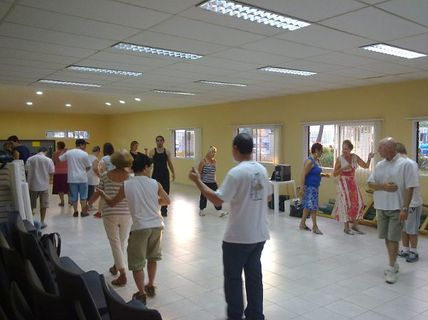 Tango is a community dance. Tango gives back to the community. It is generous in nature. Tango for product launches and events.